Alexander von Humboldt was originally built in 1906 by the German shipyard AG Weser at Bremen as "Reserve Sonderburg". She was operated throughout the North and Baltic Seas until being retired in 1986. 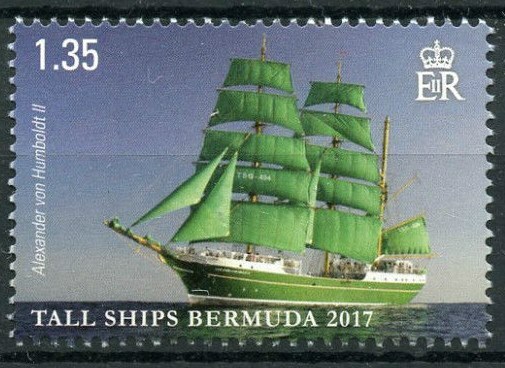 Subsequently she was converted into a three masted barque by the German shipyard Motorwerke Bremerhaven and was re-launched in 1988 as Alexander von Humboldt. Planned and ordered in 1906 as a reserve light vessel (to stand in for other light vessels during scheduled yard maintenance), the ship was launched on 10 September 1906 at AG Weser with construction serial number 155 as the first of its class. Her hull was based on a sailing ship, as was common in this class. There is no clear record if she was christened Reserve Fehmarnbelt (after her first station) or Reserve Sonderburg, as both names are documented. On the ship's bell appears Reserve; a first home port at Sonderburg (today Sonderborg, Denmark) is most likely. From 1920 to 1945 the ship was home ported at Kiel-Holtenauand served in many locations, but mainly along Baltic shores. She was installed in 1945 as a permanent replacement for the bombed and damaged light vessel Kiel. In the spring of 1957 she was rammed by a Swedish freighter and sank, was raised and after a two-year overhaul returned to service in 1959. During the summer of 1967 her location was upgraded to a lighthouse and she returned to stand-by reserve for North Sea deployment. Eventually she was assigned as permanent replacement for the retired Amrumbank. Being supplanted again by a fully automated light vessel – and following another collision and overhaul in Wilhelmshaven – was towed to Bremerhaven and named Confidentia. A newly established foundation, the Deutsche Stiftung Sail Training or DSST [German Sail Training Foundation] bought the vessel and transformed her into a Tall Ship based on her sailing ship hull. 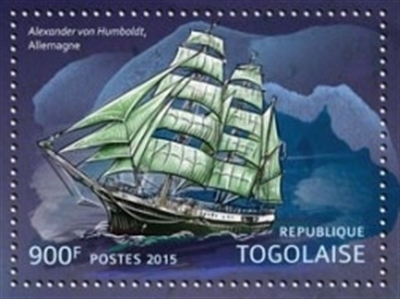 On 30 May 1988 she was christened Alexander von Humboldt after the celebrated German explorer. 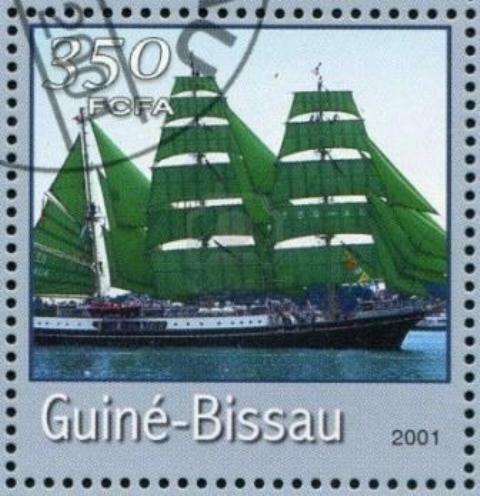 In a historical reference to the sailing ships of the Rickmers shipping company of Bremen, her hull was painted green. 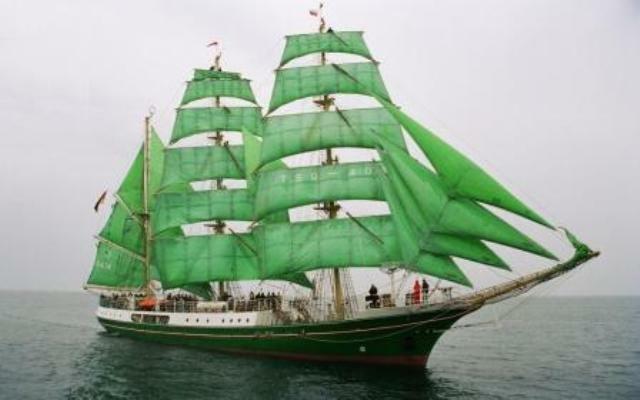 Green sails were installed as a marketing tool for advertizing campaigns by the ship's sponsor, the German brewer Beck's. "Alex", as she is called by her crew, serves as a sail training ship and is the flagship of DSST and has traveled over in 20 years (equal to 14 times around the equator). 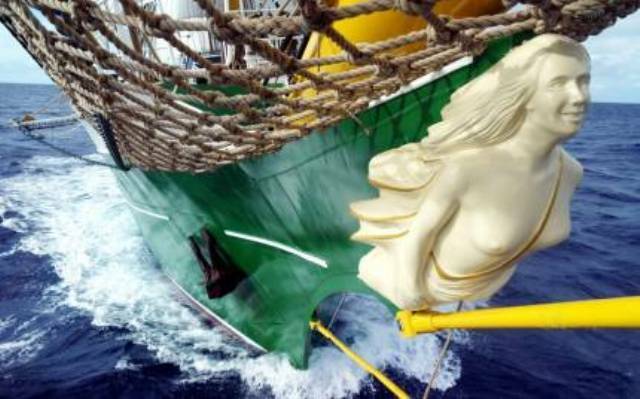 High points every year are tall ship's races and winter cruises to the Canary Islands in the North Atlantic Ocean. During summer months she sails in the North and Baltic Seas. Her longest cruise to date was a voyage in commemoration of Alexander von Humboldt's expedition to South America and the Caribbean. On 19 January 2006, Alex rounded Cape Horn under sail, following the route of the legendary Tall Ships of the 19th and early 20th century in celebration of her centenary year. GUINE BISSAU 2001 350 FCFA sg?, scott? Togo 2015 900F sg?, scott? Bermuda 2017 1.35c sg?, scott? 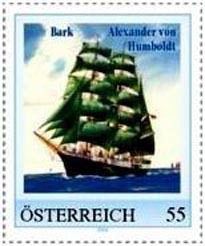 In October 2011 ALEXANDER VON HUMBOLT was taken out of service for DSST and replaced by the newly built ALEXANDER VON HUMBOLDT II. She was sold and relocated to the Bahamas in early 2012. In early 2013 she was sailed back to Europe, as the anticipated cruise business in the Caribbean did not materialize; as of November 2013 the hull has been repaired and repainted, but bowthruster and main propeller have been permanently removed. In 2014, she was converted into a small hotel (42 bunk beds in 16 cabins) and restaurant. Since 19 April 2015, she was located in the Europahafen Bremen, with plans to move her to the Schlachte in 2016. The move took place on October 24 of that year, with the masts and rigging removed to make the ship fit underneath the three bridges it had to pass to reach its final destination.